This exercise helps to develop an awareness of the changing colours of the seasons and shows that the mood of a landscape can be conveyed through colour alone. 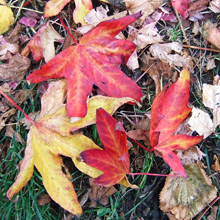 Discuss the colours and the moods associated with a particular season. For example, the countryside in winter is predominantly soft blues and greys with muted umbers, sienna and ochres. Paint or draw the characteristics of a landscape using colour only, without representing trees, fields, hills, etc. Look at some landscape artists' work where colour is the main way of conveying the moods of the landscape. A4 drawing paper, coloured pencils, pens, pastels or paint. A selection of landscape artists' work: eg Van Gogh's Crows Over Cornfield 1890, Summer Evening 1888, The Arles Country Under Snow 1888, Ivon Hitchens' Autumn Ride No2 1951, Summer Water 1961, Terwick Mill Series 1944-5, Patrick Heron's Sydney Garden Paintings 1989 -90.